Washington, DC - November 22 still has meaning for me. Although I was in elementary school on this day in 1963, I vividly remember the shock and horror of a nation that experienced the brutal murder of its young and popular president on a Dallas street. But November 22 apparently no longer means much to either George W. Bush or his neo-con cabal who are currently consolidating their dominance over the Pentagon and setting their sights on the CIA and State Department. grave site on the morning of November 22, 2004. This morning I decided to pay my respects to President and Mrs. Kennedy by doing something I don't do very often in Washington - visit a memorial. 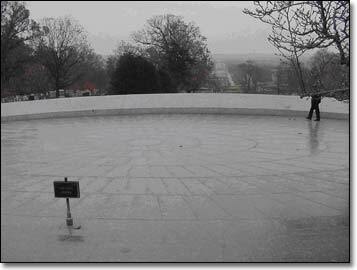 I first noticed something amiss when I walked through the main gate to Arlington National Cemetery from Memorial Drive, the same causeway that, on November 25, 1963, bore President Kennedy's horse-drawn coffin from Washington to be laid to final rest upon a hilltop overlooking the city. 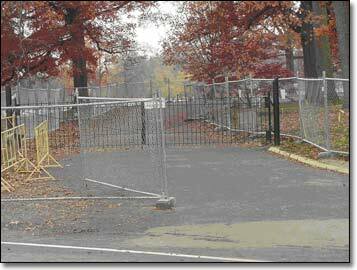 Roosevelt Drive, a pedestrian walk that pedestrians once took as the most direct route to the JFK Memorial was blocked by chain link fences and the iron gate was closed. Those wishing to visit the Kennedy gravesite were forced to walk over a mile out of their way, much of it uphill, to the site. For the old and infirm, the walk would have been too much. Taking the long route around to the JFK grave, it became apparent that other access routes near the memorial had also been closed, including Weeks Drive, a shortcut to Roosevelt Drive. There was no noticeable construction and the barricades prohibiting direct access to the Kennedy site were temporary in nature. is closed to the public on the 41st anniversary of the president's assassination in Dallas. When I finally arrived at the grave, I was not surprised to find it - for a short time - devoid of other visitors. A sole National Park Service guard stood duty. It was as if November 22, 1963 and what happened that day was some insignificant factoid of American history. Making matters worse, there is now a video game from Britain called "JFK Reloaded" in which a player can be Lee Harvey Oswald and earn points by shooting Kennedy from the Texas School Book Depository. The player loses points if he or she hits Jackie. But the Bush administration, which rails against indecency on television and radio, does not feel compelled to have the Federal Trade Commission rule against the marketing of such a game to young people in the United States. Not surprisingly, the premise of the game is that Oswald did it, alone; that's exactly what the Bush family would have us believe. But more on that later. A spokesman for Senator Edward Kennedy called the game "despicable." 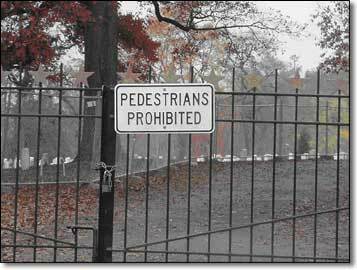 That word applies aptly here, too: those with the power to do so have walled off most of the easiest access routes to the Kennedy grave site. And it is probably no more despicable in having as the White House Press Secretary Scott McClellan, whose father and Texas attorney, Barr McClellan, penned a book suggesting that Lyndon Baines Johnson was behind the assassination. In fact, Johnson always suspected that the CIA, whose ranks included one Texas oilman named George H. W. Bush, was somehow involved with the assassination of President Kennedy. the Memorial Drive entrance to Arlington National Cemetery. 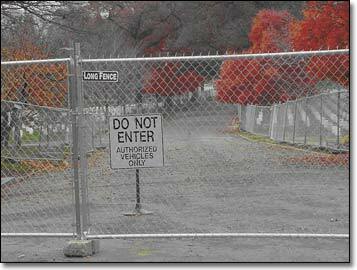 Just why the Department of Defense and the Department of the Army would need to close off the major access routes to President Kennedy's grave site on November 22 is anyone's guess. Washingtonians are accustomed to barricades around our most cherished and popular monuments and landmarks, but this is a new level of symbolic aggression and contempt. The National Cemetery Administration told me that complaints about closing off the route to the Kennedy grave should be directed to the Departments of the Army and Defense. It was the intention of the Kennedy family and his administration that the President be buried on federal property so the grave would be accessible to the American people. That was the wish of Secretary of Defense Robert McNamara after he heard that initial plans were to bury the President in the Kennedy family's plot in Holyhood Cemetery near Brookline, Massachusetts. McNamara, in his capacity as Secretary of Defense, made special plans to inter Kennedy at Arlington. The current Secretary of Defense, Donald Rumsfeld, apparently saw no problem with blocking easy access to the Kennedy grave site on this 41st anniversary of the President's assassination. 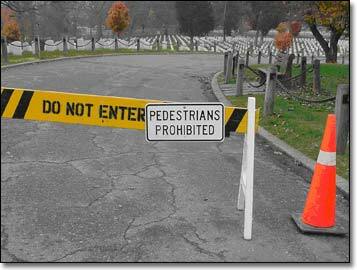 memorial services, today only a sole National Park Service ranger stands vigil. Perhaps the memory of Kennedy is a bit too much for the neo-cons in the Pentagon. Just consider the differences between Bush and Kennedy. One was a bona fide war hero who was beloved by the American people and the world. The other is a draft dodger who failed to show up for his required medical exams and mandatory training and duty and is hated throughout the world. One started the Alliance for Progress to create better living conditions in Latin America. The other permits his thuggish Secret Service agents to get into a fracas with Chilean security agents and creates a diplomatic incident by requiring Asia Pacific Economic Cooperation banquet guests in Santiago to go through a metal detector. One brought the world to peace from the edge of nuclear war. The other seeks to plunge the world into a series of never-ending wars. One was brutally murdered in Dallas. The other used Dallas as a base to feather his financial nest by making deals on money-losing oil exploration companies, a taxpayer-funded baseball stadium, and shady political accommodations with crooked politicians and terrorist-connected Saudis that would make the politicians of Tammany Hall uncomfortable. 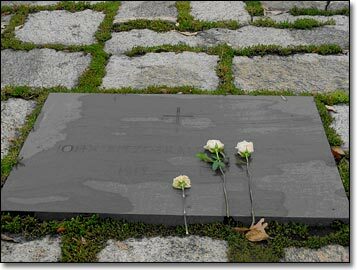 Three roses atop President Kennedy's grave. There is something about the name "Kennedy" that seems to make the Bushes quite upset. The USS John F. Kennedy was even dispatched on a dangerous deployment in the Persian Gulf as part of an exercise aimed primarily at future military action against Iran. Morale on board the Kennedy is at an all-time low, and in recent months its Commanding Officer and a fighter squadron commander have been relieved for cause. E-mails from Navy personnel on the ship confirm that tempers against the Pentagon and Bush are running high. But there is something else about John F. Kennedy in particular that makes the Bushes jumpy. The name "George Bush" appears much too frequently in documents, some newly released, relating to the assassination of President Kennedy. Since there is no statute of limitations on murder or accessory to murder, I can understand why Bush pere and fils may want to erase November 22, 1963 from the history books. BUSH stated that PARROTT is possibly a student at the University of Houston and is active in political matters in the area. He stated that he felt Mrs. FAWLEY, telephone number SU 2-5239, or ARLENE SMITH, telephone number JA 9-9194 of the Harris County Republican Party Headquarters would be able to furnish additional information regarding the identity of PARROTT. So we have George H. W. Bush telling the FBI that he did not know the source of the information but knew that a John Bircher named James Parrott, who was the same age as Lee Harvey Oswald (24), wanted to kill President Kennedy in Houston. Bush did not know much about Parrott but gave the name of two Republican Party officials in Houston. Of course, Bush's Zapata Off-Shore Drilling Company had been a CIA front since 1960 and had supplied the Bay of Pigs invasion (code named "Zapata") force with two of his company's ex-U.S. Navy landing craft, renamed the "Barbara J" and the "Houston." In any case, Bush's phone call to the FBI was a false lead, and Parrott was cleared. However, Bush's phone call creates more questions about him than about Parrott. First of all, there is no evidence that Bush was in Tyler when Kennedy was shot. There was no Caller ID in those days that would have allowed Special Agent Kitchel to know, for a fact, that Bush was calling from Tyler. Bush's wife, Barbara, claimed he was in Tyler but Bush once said he may have been in Port-au-Prince, Haiti that day. But Bush himself admits to the FBI that he was booked into the Sheraton Hotel in Dallas on November 22. Bush always had a keen interest in what files the government had on Kennedy's assassination. When he was CIA Director in 1976, Bush wanted to see all the agency's files on the Kennedy assassination. His memos specifically requested information on Oswald, Jack Ruby, and others linked to the assassination. In her book The Family: The Real Story of the Bush Dynasty, author Kitty Kelley writes that "Years later, when [Bush] became president of the United States, he would deny making any attempt to review the agency files on the JFK assassination… when he made this claim, he did not realize that the agency would release 18 documents [under the Freedom of Information Act] that showed he had indeed, as CIA director, requested information-not once, but several times-on a wide range of questions surrounding the Kennedy assassination." Our Miami, Florida, Office on November 23, 1963, advised that the Office of Coordinator of Cuban Affairs in Miami advised that the Department of State feels some misguided anti-Castro group might capitalize on the present situation and undertake an unauthorized raid against Cuba, believing that the assassination of President John F. Kennedy might herald a change in U.S. policy, which is not true. Our sources and informants familiar with Cuban matters in the Miami area advise that the general feeling in the anti-Castro Cuban community is one of stunned disbelief and, even among those who did not entirely agree with the President's policy concerning Cuba, the feeling is that the President's death represents a great loss not only to the U.S. but to all of Latin America. These sources know of no plans for unauthorized action against Cuba. The substance of the foregoing information was orally furnished to us, George Bush of the Central Intelligence Agency and Captain William Edwards of the Defense Intelligence Agency on November 23, 1963 by Mr. W.T. Forsyth of this Bureau. A copy of the above memo was furnished to the Director of Naval Intelligence. That is important for reasons that will be explained in the following paragraph. Not only was George H. W. Bush, a known CIA operative, in Dallas on November 22 but he was also keeping track of the stance of pro-Castroites in Miami. That would have been important because Lee Harvey Oswald, Kennedy's accused assassin was supposed to be a pro-Communist member of the "Fair Play for Cuba Committee." But he was also associated with the "Anti-Communist League of the Caribbean" and "Friends of Democratic Cuba." And his apparent control officer was FBI agent Guy Bannister, formerly of the Chicago FBI office and a former Naval Intelligence officer, whose office "Guy Bannister Associates, Inc." a CIA cut-out for training anti-Castro Cubans, was located at 544 Camp Street in New Orleans. 544 Camp was also the address used by Oswald's "pro-Communist" "Fair Play for Cuba Committee." The local Office of Naval Intelligence was across the street from 544 Camp. The Director of Naval Intelligence is made privy, as an "info addee," to the aforementioned State Department memo on the reaction of pro- and anti-Castro Cubans in Miami to Kennedy's death. Oswald, while stationed at a classified U-2 base in Japan as a U.S. Marine, would have had his security clearance adjudicated by the Office of Naval Intelligence. Bush's role as a CIA operative in the Bay of Pigs invasion, a military action in which the Office of Naval Intelligence was closely involved, suggests that the other links between Bush, ONI, and the anti-Castro Cuban exiles are not benign. George H. W. Bush has still other, more oblique links to Kennedy assassin. The Houston-based conspirator James Parrott, Guy Bannister was a fervent John Bircher. Bannister was not only associated with Oswald but also David Ferrie, the commander of a Louisiana Civil Air Patrol unit whose members included not only Oswald but also James Reynolds Bath, the future buddy and Texas Air National Guard pal of George W. Bush. According to one of Bath's former Houston business associates, Bath became a pilot through the cadet program of the Louisiana Civil Air Patrol, a known recruiting ground for future CIA agents. Six days before Pearl Harbor, the Civil Air Patrol was founded by Dallas oilman David Harold Byrd who also owned the Texas School Book Depository from the 1930s to 1972. Another supporter of the Louisiana Civil Air Patrol was Claire Chennault, the founder of China's "Flying Tigers" and the notorious "Civil Air Transport" of China that later became Air America. Chennault died in New Orleans' murky intelligence-connected Ochsner Foundation Hospital in 1958. In 1964, Byrd apparently removed the "Oswald" window pane from the fifth floor of the Texas School Book Depository and made it a souvenir fixture in his home. "Bush, George H.W. (Poppy) 1412 W. Ohio also Zapata Petroleum Midland" Number: "4-6355"
From the directory entry it appeared that DeMohrenshildt, who was rumored to be with the CIA, knew George H. W. (or Poppy as his family calls him) from before 1959, when Bush moved from Midland to Houston. It is also noteworthy that while he was taking care of the Oswalds during 1962, DeMohrenshildt was in close contact with Admiral Henry Bruton, the former Director of Naval Communications, who would have played an important supporting role for Naval Intelligence's activities in the Bay of Pigs invasion. As I walked away from President Kennedy's grave site this morning - looking forward to another one mile detour around the normal direct access walkway - I pondered why the Pentagon and the White House would dishonor our 35th President in such a manner on the anniversary of his murder. But then the words of President Kennedy's Inaugural Address on January 20, 1961 sprang to my mind: "In the long history of the world, only a few generations have been granted the role of defending freedom in its hour of maximum danger. I do not shrink from this responsibility - I welcome it. I do not believe that any of us would exchange places with any other people or any other generation. The energy, the faith, the devotion which we bring to this endeavor will light our country and all who serve it-and the glow from that fire can truly light the world." The "Eternal Flame" - still casts a glow on an otherwise dark and gloomy Washington. Kennedy spoke of light. The Bushes speak of fear and gloom and they represent darkness. If he were alive today, Kennedy would agree that as with World War II and the Cold War, freedom is once again in its "hour of maximum danger" - a danger from within the United States, from within the country's own institutions of government. 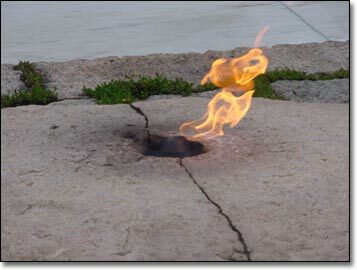 By closing off the roads leading to Kennedy's Eternal Flame, the Bush administration is once again showing its contempt for America's traditions, its past. But as suggested in this article, the Kennedy assassination may be something the Bushes do not want that Eternal Flame to illuminate. A private jet that was en route to Houston to pick up former President Bush clipped a light pole and crashed Monday as it approached Hobby Airport in thick fog, killing all three people aboard. The Gulfstream G-1159A jet, coming into Houston, went down about 6:15 a.m. in an undeveloped area 1 1/2 miles south of the airport, officials said. The former president had been scheduled to travel to Ecuador for a conference. God does, it appears, work in mysterious ways. Wayne Madsen is a Washington, DC-based investigative journalist, author, and syndicated columnist. He is the author of the forthcoming book, Jaded Tasks: Big Oil, Blacks Ops & Brass Plates.